Luponic Distortion is one of the best IPAs in California with one of the greatest names, and it is brewed by Firestone Brewery. 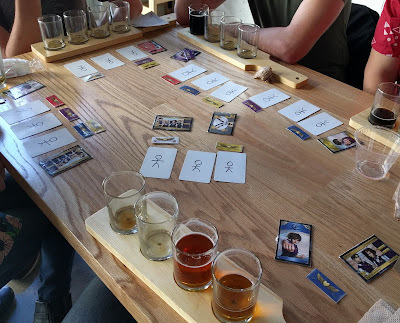 If you would like to learn more about this epic brewery and its founders, the Lion and the Bear, read my summary here. The beer itself is rated 97/100 on Ratebeer and is a solid 6% IPA. You can find it in cans, which is perfect to take to the beach with you. Last thing you should know about this beer: They say the taste of Luponic Distortion is the only thing that can make the great Chuck Norris cry...but too bad he's never tasted it before. What goes well with this epic IPA? PANDEMIC! 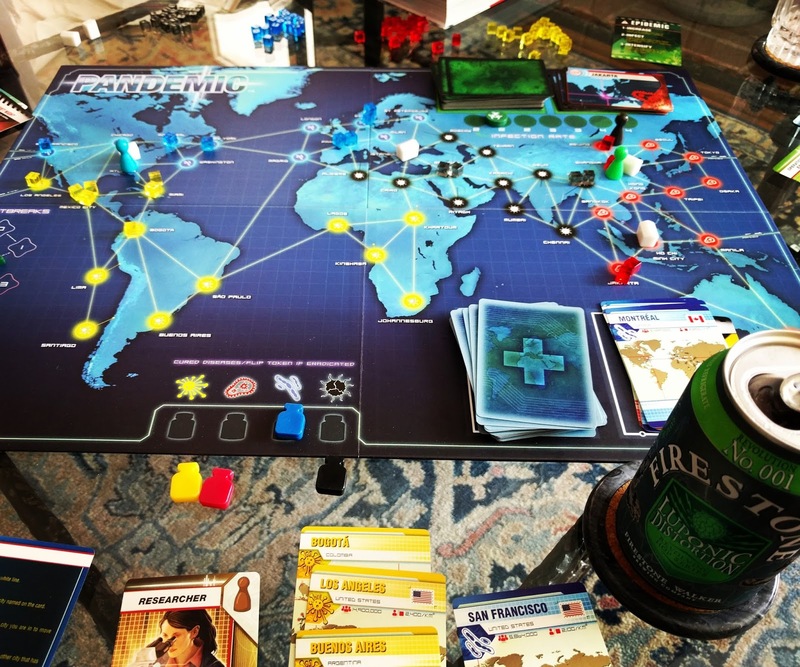 Pandemic is probably THE most popular and hyped up cooperative games on the market. It was a nominee for the Spiel des Jahres (Game of the Year) in 2009, and the Legacy version of the game was just a runner up for the Kennerspiel des Jahres (Advanced Game of the Year) this year, 2016! Check out the photo of the amazing board above. In Pandemic, you and your friends fight to save humanity in a game where deadly viruses are spreading across the globe. Together, you will treat diseases, share knowledge, and fly all over the world to prevent outbreaks and slow down the constantly spreading epidemics. 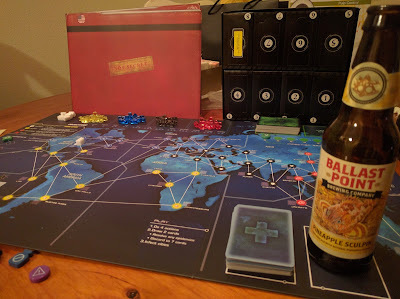 It's an amazing cooperative game for 2-4 players, and I highly recommend you buy the base version of the game. After all, the fate of humanity is in your hands, so put down your delicious IPA and save the day!